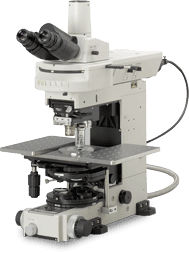 Upright Microscope Eclipse FN 1 | EINST Technology Pte Ltd. The focus knob and field diaphragm ring are located on the front part of the microscope base and there are no cumbersome outside belts, so operation is easy when using a fixed stage. The coarse/fine focus knob is located on both the left and right sides, so it can be operated with either hand. An optional remote handle enables ON/OFF and light intensity adjustment of the fiber illumination from outside the cage.